Among the many clinical skills devoted to the airway management both in the operating room (OR) and out of OR, ability to provide a safe and efficient Rapid Sequence Intubation (RSI) is arguably one of the most widely utilized and beneficial when clinically indicated. Although, the majority of the published data regarding RSI refer to pre-hospital and emergency room induction/intubation, it can be used to guide practice in various healthcare settings. In a multicenter longitudinal study of 8,937 emergency department (ED) intubations from 1997-2002, Walls et al., reported RSI was the initial method chosen in 6,138 of 8,937 intubations (69%) and in 84% of all encounters that involved any intubation medication. Similarly, during a 58 month prospective observational study of physicians performing more than 6,000 intubations at 31 university-affiliated EDs in three nations, Sagarin et al., noted that RSI was used in 78% of initial attempts and resulted in 85-91% success rate of tracheal intubation overall. This trend has also been shown in the pediatric population. The same authors also showed that RSI is the method of choice for the majority of pediatric emergency intubations (81%), and was associated with a high success rate (78%) and a low rate of serious adverse events (1%). Furthermore, RSI has been cited as the most common method used to secure the airway in intensive care unit (ICU) patients by Schwartz et al.,  indicating the importance of this technique outside of the ED and OR. Applying measures to decrease the chances of pulmonary aspiration of gastric contents. The first objectives is routinely accomplished by pre-oxygenation, typically 100% oxygen for 3-5 min before induction of anesthesia, allowing the patient to sustain apnea for a period of 5-8 min without hypoxia. The second objective involves minimization of the induction-intubation interval, suggesting that a fast-acting hypnotic agent should be administered along with a rapid onset neuromuscular blocking agent. 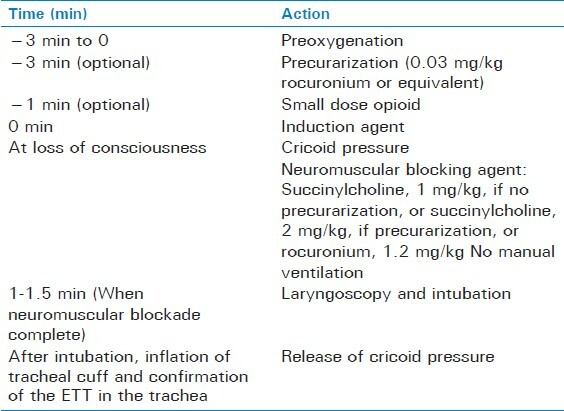 Finally, measures to decrease the chance of aspiration include applying cricoid pressure (CP), refraining from positive pressure ventilation before tracheal intubation is accomplished, and waiting until neuromuscular blockade is complete to perform laryngoscopy and tracheal intubation [Table 1]. With RSI being such an integral skill in the management of the airway, guidelines and/or at minimum a consensus as to the proper way to conduct each step of the technique in appropriate situations would be beneficial. As a basis for discussion, it has been suggested that the algorithm of RSI consist of six primary steps: Pre-oxygenation, premedication, induction and muscle relaxation, intubation, primary and secondary confirmation, and post-intubation patient management. Even in the event that a classic RSI is not indicated, modifications to the accepted standards of care are frequently utilized. In a survey of current practice in the US, Rhenfield and associates established three defining features of a modified RSI: Oxygen administration before induction; the use of CP; and an attempt to ventilate the patient's lungs before securing the airway. Studies focusing on the inherent strengths and weaknesses in each step of the algorithm are a recurrent topic in the scientific literature. Pre-oxygenation has been associated with atelectasis,  however, this is a minor problem considering the added protection afforded by prolonging apnea duration secondary to increase in oxygen content in the lungs. Application of CP has been heavily criticized,  and positive pressure ventilation has been advocated by some. In addition, there is uncertainty regarding which patients should be considered as having a full stomach and who should undergo RSI. Furthermore, the overall effectiveness of the whole procedure in preventing aspiration of gastric contents has not been evaluated. However, the approach is logical and widely applied. Despite the more general alterations in pharmacodynamics caused by patient pathology, the specific choice of neuromuscular blocking agents used in RSI must also be considered carefully. With the objective to reduce the induction to intubation interval as much as possible, the advantage of a short-onset drug like succinylcholine is obvious choice, yet a short duration of action is also of great value as the apneic interval may often be shorter than the time to onset of hypoxia. An average, non-obese, pre-oxygenated adult may sustain 7-8 min of apnea without becoming hypoxic. The duration of action of succinylcholine 1 mg/kg at the adductor pollicis is slightly longer, 8-12 min, but the diaphragm recovers before the peripheral muscle. At least three studies have tried to tackle this problem. In a small number of volunteers, Heier et al., found that 25% of subjects had oxygen saturation below 80% after a thiopental succinylcholine sequence, whereas the remaining 75% started breathing before onset of desaturation. Hayes et al., reported an 11% incidence of hypoxia in a larger subset of patients, and Naguib et al., noted that 85% of subjects had hypoxia before they started breathing again. , Interestingly, the time to resumption of diaphragmatic movements was the same in all three studies cited, 4-5 min, and there was a greater incidence of desaturation in subjects with larger body mass index (BMI). Thus, we can conclude that succinylcholine 1 mg/kg does not allow return of spontaneous respirations before the onset of hypoxia in all patients, as the mean duration of apnea was 4-5 min, but it was reported as long as 9 min in some individuals. Also, the variability in the effectiveness of pre-oxygenation may be more important than variability of succinylcholine effect itself. For example, the quantity of oxygen that can be stored in lungs and body stores is reduced in obese subjects, and increased oxygen consumption, as may occur in trauma and sepsis, is likely to reduce the already brief period of normoxia. While the need for muscle relaxants for RSI has been demonstrated, there are potential detrimental effects as well. The most deadly instance of such effects is a 'cannot ventilate, cannot intubate' situation. Succinylcholine has been the drug of choice for rapid sequence induction for many years due to its rapid onset, however due to its depolarizing effects and wide range of adverse effects, other drugs have been sought to replace it. Although the short duration of action of succinylcholine offers some kind of protection against the inability to intubate and ventilate, this is not the case with all nondepolarizing agents. Some authors advocate rocuronium as a replacement, with onset nearly as fast as succinylcholine, fewer adverse events. At 1.2 mg/kg, onset of paralysis with rocuronium is less than 1 min  but recovery of T1, (minimal level of paralysis needed for reversal of paralysis with neostigmine) can be greater than 40 min. While the ability to recover from succinylcholine in time to begin spontaneous respirations in a 'cannot intubate, cannot ventilate' situation is theoretically possible, return of spontaneous respiration is not possible if rocuronium is used in such situations. Sugammadex, a novel drug for reversal of rocuronium, may solve this problem in patients where the clinical scenario is 'cannot intubate, cannot ventilate' by returning patient to spontaneous ventilation, yet it is not Food and Drug Association (FDA) approved in the US following reports of adverse reactions. Some of the commonly used hypnotics and muscle relaxants used for RSI are listed in [Table 2]. Brisson and Brisson conducted an observational study showing the great variability in the application of CP, identifying 10 different techniques in 32 observations, noting that misapplication does occur with possible patient harm. They recommend using the three-finger CP technique as originally described by Sellick [Figure 2] and thought that this technique is effective, easy to teach, and safely keeps the fingers in the midline of the cricoid cartilage. It is evident that the educational approach to CP requires some modernization. Estimating and becoming proficient at applying the correct amount of pressure to the cricoid cartilage is a skill in and of itself. It is suggested that 10 Newton's (N) of CP be applied just prior to loss of consciousness, increasing to approximately 30 N force at the onset of anesthesia. The recommended force to prevent gastric reflux is between 30 and 40 N, equivalent to 3-4 kg, but force greater than 20 N can cause pain and retching in awake patients, and a force of 40 N can distort the larynx and complicate intubation. With this knowledge in hand, how are we ensuring that the correct pressure is being applied? Kopka and Crawford suggest a simple biofeedback trainer may be useful in ensuring safe and reliable CP application during RSI, as they were able to show a 48% improvement in the number of trainees able to apply correct awake cricoid force, and a 72% improvement in the number of subjects able to apply correct asleep cricoid force. Flucker et al., also experienced success using a simple 50-millilitre syringe as an inexpensive training aid in the application of CP. Their training lead to a significant improvement in accurate CP application which was maintained for 1 week for both 20 N and 40 N, however, the accuracy of the skill was lost after 1 months time when not routinely evaluated. Just as any other procedural skill in medicine, practitioners must develop the appropriate muscle memory to be able to consistently perform the maneuver, which appears to require frequent evaluation and repetition. So with all of the controversy and disagreement surrounding CP, in addition to the lack of evidence supporting or dismissing its proposed benefit, why do we continue to insist on its application on a daily basis? Perhaps, we can shed some light on this question by examining recent accounts of legal action noted in the literature. Cook et al., analyzed claims notified to the National Health Service (NHS) Litigation Authority in England between 1995 and 2007 filed under anesthesia to explore patterns of injury and cost related to airway or respiratory events. The total cost of (non-dental) airway claims was 4.9 million pounds (84% closed, median cost 30,000 pounds) and accounted for 12% of anesthesia-related claims, 53% of deaths, 27% of cost and 10 of the 50 most expensive claims in the dataset, frequently describing events at induction of anesthesia. Furthermore, a retrospective study evaluating malpractice claims at a university hospital in Paris found that out of the 789 claims resulting from surgical activity over a 15-year-period, 41 were directly anesthesia-related, and many of the most frequent problems included the consequences of difficult intubation or aspiration of stomach contents. Expanding on the specific application of CP, a judge in the United Kingdom did rule against an anesthesiologist for failing to apply CP in a patient with an irreducible hernia who had regurgitated and aspirated. The judge argued that we cannot assert "that cricoid pressure is not effective until these trials (RCTs) have been performed, especially as it is an integral part of an anesthetic technique that has been associated with a reduced maternal death rate from aspiration since the 1960s." Thus, regardless of one's approval or disapproval of CP, it is possible that we have necessitated its application simply by the fact that we persistently perform the maneuver, and that it can be classified as "an integral part of an anesthetic technique" by those assessing the legal ramifications of its use, or lack there of. RSI has proven to be, and will continue to remain an important tool available to the clinical practitioner for induction of anesthesia in applicable situations. The development of new drugs and the acceptance/validation of those less widely utilized will continue to advance the efficacy of the technique and ensure that the excellent level of safety RSI has come to provide does not falter. However, with the ever growing medical complexity of the patient population, standards and algorithms can never completely take the place of an actively vigilant provider, and must continue to be viewed as a guide for best practice. In the matter of CP, we have not made any significant advancement in the immediate past to irrevocably answer the question as to whether or not the potential benefits of CP outweigh the potential risks such that every patient undergoing RSI should have CP applied. Yet, the more pressing issue may be, is this question even approachable? Perhaps, Leman sums up the heart of the matter in his 2009 review of CP, noting that "we have become far too myopic in focusing more on the documentation that cricoid pressure was applied during induction of anesthesia than on: Investigating the validity of the notion that CP prevents passive regurgitation; focusing on teaching the proper application of CP; focusing on which patients require CP; and focusing on the risk of aspiration during maintenance and emergence from anesthesia." It is important to remember however, that with the ever growing medical complexity of the patient population, standards and algorithms can never completely take the place of an actively vigilant provider, and must continue to be viewed as a guideline for best practice. 1. Walls RM, Brown CA 3 rd , Bair AE, Pallin DJ. NEAR II Investigators. Emergency airway management: A multi-center report of 8937 emergency department intubations. J Emerg Med 2011;41:347-54. 2. Sagarin MJ, Barton ED, Chng YM, Walls RM. National Emergency Airway Registry Investigators. Airway management by US and Canadian emergency medicine residents: A multicenter analysis of more than 6,000 endotracheal intubation attempts. Ann Emerg Med 2005;46:328-36. 3. Sagarin MJ, Chiang V, Sakles JC, Barton ED, Wolfe RE, Vissers RJ, et al. National Emergency Airway Registry (NEAR) investigators. Rapid sequence intubation for pediatric emergency airway management. Pediatr Emerg Care 2002;18:417-23. 4. Schwartz DE, Matthay MA, Cohen NH. Death and other complications of emergency airway management in critically ill adults. A prospective investigation of 297 tracheal intubations. Anesthesiology 1995;82:367-76. 5. Edmark L, Kostova-Aherdan K, Enlund M, Hedenstierna G. Optimal oxygen concentration during induction of general anesthesia. Anesthesiology 2003;98:28-33. 6. Di Filippo A, Gonnelli C. Rapid sequence intubation: A review of recent evidences. Rev Recent Clin Trials 2009;4:175-8. 7. Ehrenfeld JM, Cassedy EA, Forbes VE, Mercaldo ND, Sandberg WS. 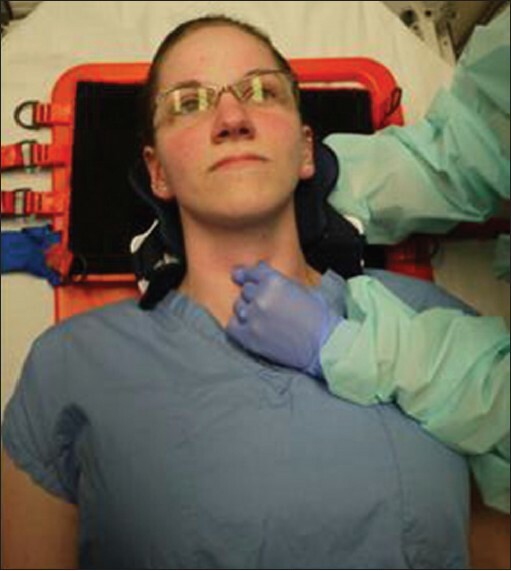 Modified rapid sequence induction and intubation: A survey of United States current practice. Anesth Analg 2012;115:95-101. 8. Brimacombe JR, Berry AM. Cricoid pressure. Can J Anaesth 1997;44:414-25. 9. Kuipers JA, Boer F, Olofsen E, Bovill JG, Burm AG. Recirculatory pharmacokinetics and pharmacodynamics of rocuronium in patients: The influence of cardiac output. Anesthesiology 2001;94:47-55. 10. Istvan J, Belliveau M, Donati F. Rapid sequence induction for appendectomies: A retrospective case-review analysis. Can J Anaesth 2010;57:330-6. 11. El-Orbany M, Connolly LA. Rapid sequence induction and intubation: Current controversy. Anesth Analg 2010;110:1318-25. 12. Landsman I. Cricoid pressure: Indications and complications. Paediatr Anaesth 2004;14:43-7. 13. Butler J, Sen A. Best evidence topic report. Cricoid pressure in emergency rapid sequence induction. Emerg Med J 2005;22:815-6. 14. Kotur PF. Sellick′smanoeuvre, to be employed or dismissed from the armamentarium of anaesthetic practice? Indian J Anaesth 2006;50:488. 15. Heier T, Feiner JR, Lin J, Brown R, Caldwell JE. Hemoglobin desaturation after succinylcholine-induced apnea: A study of the recovery of spontaneous ventilation in healthy volunteers. Anesthesiology 2001;94:754-9. 16. Hayes AH, Breslin DS, Mirakhur RK, Reid JE, O′Hare RA. Frequency of haemoglobin desaturation with the use of succinylcholine during rapid sequence induction of anaesthesia. Acta Anaesthesiol Scand 2001;45:746-9. 17. Naguib M, Samarkandi AH, Abdullah K, Riad W, Alharby SW. Succinylcholine dosage and apnea-induced hemoglobin desaturation in patients. Anesthesiology 2005;102:35-40. 18. Nava-Ocampo AA, Velazquez-Armenta Y, Moyao-Garcia D, Salmeron J. Meta-analysis of the differences in the time to onset of action between rocuronium and vecuronium. Clin Exp Pharmacol Physiol 2006;33:125-30. 19. Schultz P, Ibsen M, Ostergaard D, Skovgaard LT. Onset and duration of action of rocuronium--from tracheal intubation, through intense block to complete recovery. Acta Anaesthesiol Scand 2001;45:612-7. 20. Shields M, Giovannelli M, Mirakhur RK, Moppett I, Adams J, Hermens Y. Org 25969 (sugammadex), a selective relaxant binding agent for antagonism of prolonged rocuronium-induced neuromuscular block. Br J Anaesth 2006;96:36-43. 21. Le Corre F, Plaud B, Benhamou E, Debaene B. Visual estimation of onset time at the orbicularis oculi after five muscle relaxants: Application to clinical monitoring of tracheal intubation. Anesth Analg 1999;89:1305-10. 22. Andrews JI, Kumar N, van den Brom RH, Olkkola KT, Roest GJ, Wright PM. A large simple randomized trial of rocuronium versus succinylcholine in rapid-sequence induction of anaesthesia along with propofol. Acta Anaesthesiol Scand 1999;43:4-8. 23. Morris J, Cook TM. Rapid sequence induction: A national survey of practice. Anaesthesia 2001;56:1090-7. 24. Guirro UB, Martins CR, Munechika M. Assessment of anesthesiologists′ rapid sequence induction technique in an university hospital. Rev Bras Anestesiol 2012;62:335-45. 25. Sellick BA. Cricoid pressure to control regurgitation of stomach contents during induction of anaesthesia. Lancet 1961;2:404-6. 26. Priebe HJ. Cricoid pressure: An expert′s opinion. Minerva Anestesiol 2009;75:710-4. 27. Holmes N, Martin D, Begley AM. Cricoid pressure: A review of the literature. J Perioper Pract 2011;21:234-8. 28. Mendelson CL. The aspiration of stomach contents into the lungs during obstetric anesthesia. Am J Obstet Gynecol 1946;52:191-205. 29. Fenton PM, Reynolds F. Life-saving or ineffective? An observational study of the use of cricoid pressure and maternal outcome in an African setting. Int J Obstet Anesth 2009;18:106-10. 30. Lerman J. On cricoid pressure: "May the force be with you". Anesth Analg 2009;109:1363-6. 31. Janda M, Vagts DA, Nöldge-Schomburg GF. Cricoid pressure--safety necessity or unnecessary risk? Anaesthesiol Reanim 2004;29:4-7. 32. Management of the airway and endotracheal intubation. In: Murray MJ, Coursin DB, Pearl RG, Prough DS, editors. Critical Care Medicine: Perioperative Management. Philadelphia: Lippincott-Raven Publishers; 1997. 33. Schmalfuss IM, Mancuso AA, Tart RP. Postcricoid region and cervical esophagus: Normal appearance at CT and MR imaging. Radiology 2000;214:237-46. 34. Rice MJ, Mancuso AA, Gibbs C, Morey TE, Gravenstein N, Deitte LA. Cricoid pressure results in compression of the postcricoid hypopharynx: The esophageal position is irrelevant. Anesth Analg 2009;109:1546-52. 35. Rice MJ, Mancuso AA, Morey TE, Gravenstein N, Deitte LA. The anatomy of the cricoid pressure unit. Surg Radiol Anat 2010;32:419. 36. Tsung JW, Fenster D, Kessler DO, Novik J. Dynamic anatomic relationship of the esophagus and trachea on sonography: Implications for endotracheal tube confirmation in children. J Ultrasound Med 2012;31:1365-70. 37. Smith KJ, Ladak S, Choi PT, Dobranowski J. 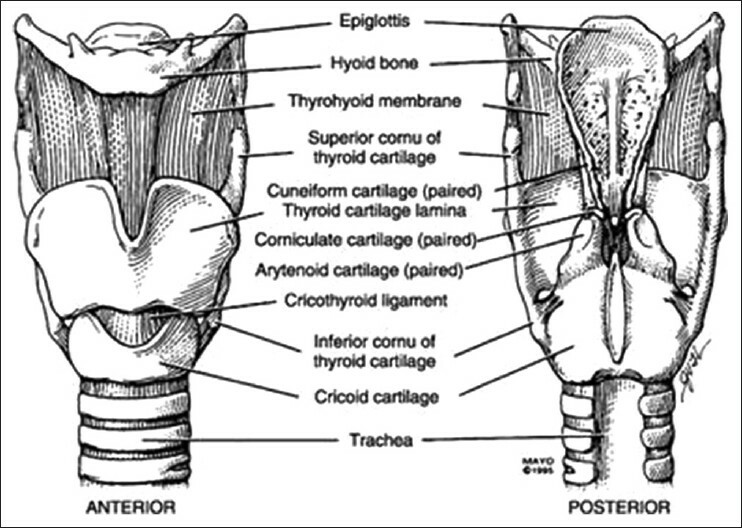 The cricoid cartilage and the esophagus are not aligned in close to half of adult patients. Can J Anaesth 2002;49:503-7. 38. Smith KJ, Dobranowski J, Yip G, Dauphin A, Choi PT. Cricoid pressure displaces the esophagus: An observational study using magnetic resonance imaging. Anesthesiology 2003;99:60-4. 39. Benkhadra M, Lenfant F, Bry J, Astruc K, Trost O, Ricolfi F, et al. Cricoid cartilage and esophagus: CT scan study of the dynamic variability of their relative positions. Surg Radiol Anat 2009;31:537-43. 40. Armstrong B, Reid C, Heath P, Simpson H, Kitching J, Nicholas J, et al. Rapid sequence induction anaesthesia: A guide for nurses in the emergency department. Int Emerg Nurs 2009;17:161-8. 41. Nafiu OO, Bradin S, Tremper KK. Knowledge, attitude, and practice regarding cricoid pressure of ED personnel at a large U.S. teaching hospital. J Emerg Nurs 2009;35:11-5. 42. Brisson P, Brisson M. Variable application and misapplication of cricoid pressure. J Trauma 2010;69:1182-4. 43. Vanner RG, Asai T. Safe use of cricoid pressure. Anaesthesia 1999;54:1-3. 44. Kopka A, Crawford J. Cricoid pressure: A simple, yet effective biofeedback trainer. Eur J Anaesthesiol 2004;21:443-7. 45. Flucker CJ, Hart E, Weisz M, Griffiths R, Ruth M. The 50-millilitre syringe as an inexpensive training aid in the application of cricoid pressure. Eur J Anaesthesiol 2000;17:443-7. 46. Ralph SJ, Wareham CA. Rupture of the oesophagus during cricoid pressure. Anaesthesia 1991;46:40-1. 47. Vanner RG, Pryle BJ. Regurgitation and oesophageal rupture with cricoids pressure: A cadaver study. Anaesthesia 1992;47:732-5. 48. Gabbot DA. The effect of single-handed cricoid pressure on neck movement after applying manual in-line stabilization. Anaesthesia 1997;52:586-8. 49. Heath KJ, Palmer M, Fletcher SJ. Fracture of the cricoid cartilage after Sellick′smanouvre. Br J Anaesth 1996;76:877-8. 50. Shorten GD, Alfille PH, Gliklich RE. Airway obstruction following application of cricoid pressure. J Clin Anesth 1991;3:403-5. 51. Arenkiel B, Smitt M, Olsen KS. The duration of fibre-optic intubation is increased by cricoid pressure. A randomised double-blind study. Acta Anaesthesiol Scand 2013;57:358-63. 52. Boet S, Duttchen K, Chan J, Chan AW, Morrish W, Ferland A, et al. Cricoid pressure provides incomplete esophageal occlusion associated with lateral deviation: A magnetic resonance imaging study. J Emerg Med 2012;42:606-11. 53. Cook TM, Scott S, Mihai R. Litigation related to airway and respiratory complications of anaesthesia: An analysis of claims against the NHS in England 1995-2007. Anaesthesia 2010;65:556-63. 54. Lienhart A, Chigot JP. Claims related to anesthesia at the University Hospitals of Paris. Ann Fr Anesth Reanim 1996;15:215-9. 55. Vanner R. Cricoid pressure. Int J Obstet Anesth 2009;18:103-5.